Check out this fun USB gadget, the Domo USB Flash Drive. The Domo USB Flash drive measures about 2 inches tall, is USB 2.0 compatible, and comes with 1GB of storage. The stop-motion animated face of Japan’s NHK Television, Domo is bringing his pop-iconhood overseas in the form of a series of Nicktoons shorts and the very first Domo Mimobot Series of Designer USB Flash Drives! 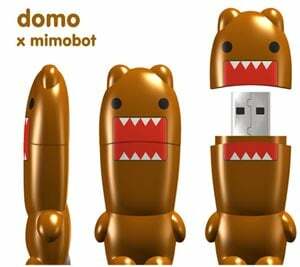 The Domo USB Flash Drive comes preloaded with great Domo content, including the Mimobot SoundByte application, wallpapers, icons, and the original NHK spots featuring Domo himself! The Domo USB Flash Drive is available to buy online for $39.99 from Perpetual Kid.